Buy Fentanyl test strips in a pack consisting of 25 strips at an attractive price with 12 Panel Now. With the stamped ease of use and convenience, the urine drug test strips promise to give 99% accurate results after examining the human urine. The results can be attained within five minutes. It be noted that the fentanyl urine test strips are used to detect fentanyl in human urine. Fentanyl is known to be a synthetic opioid connected with the family of phenylpiperidines. It is more dangerous than morphine and tends to dissolve in lipid causing damage to human brain. The impact could be seen in the half-life for equilibration between plasma and cerebrospinal fluid of approximately 5 minutes for fentanyl. 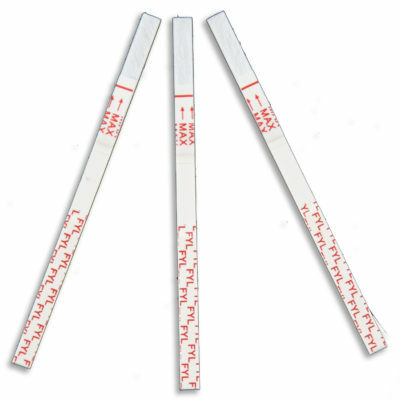 The Fentanyl urine test strips closely monitor the change of the color of the strip to confirm the absence or presence of fentanyl. The antibody-drug conjugates are deactivated on the test region of the membrane. During the test, the collected urine specimen reacts with antibodies conjugated to colored particles and percolated on the sample pad. Procedure of the Fentanyl Test Strips Bring test, specimens, buffer and/or controls to room temperature (15-30 degree Celsius) before use. Remove the test from its sealed pouch, or remove one strip from the canister, and use it as soon as possible. For best result, the assay should be performed within an hour. Canister should be closed tightly after removing strips. Hold the strip by the end, where the product name is printed. To avoid contamination, do not touch the strip membrane. After the test has finished running, remove the strip from the specimen and place it on a non-absorbent flat surface. Start the timer and wait for the colored band(s) to appear. The result should be read at 5 minutes. Do not interpret the result after 10 minutes.